A little under two decades ago, a diagnosis of Human Immunodeficiency Virus (HIV)/Acquired Immunodeficiency Syndrome (AIDS) was viewed as a death sentence. Fortunately, antiretroviral therapy, specifically highly active antiretroviral therapy (HAART), has enabled HIV/AIDS patients to live longer, healthier lives . With this increased survival, clinicians are now managing some of the manifestations of long-term HIV-infection. For instance, opportunistic infections (OIs) were once the leading cause of HIV/AIDS-related morbidity and mortality, but widespread use of HAART and OI prophylaxis has been highly effective in reducing the incidence of such infections [2, 3]. Presently, other non-AIDS-defining chronic condit-ions have emerged as problematic for HIV/AIDS patients. These conditions include renal insufficiency, hepatic disorders, metabolic abnormalities, and cardiovascular disease (CVD) [4-6]. CVD refers to a host of diseases and atherosclerotic processes that affect the cardiovascular system. The list of conditions that comprise this disease vary across different entities. For example, the American Heart Association (AHA) defines CVD as hypertension, coronary heart disease (myocardial infarction and angina pectoris), heart failure, stroke, or congenital cardiovascular defects . The definition provided by the World Health Organization (WHO), however, is more inclusive. The WHO defines CVD as coronary heart disease, cerebrovascular disease, peripheral arterial disease, rheumatic heart disease, congenital heart disease, or deep vein thrombosis/pulmonary embolism . Risk factors for developing CVD, in the absence of HIV/AIDS, typically include diabetes mellitus, high blood pressure, chronic kidney disease, obesity, tobacco use, and dyslipidemia . In addition to these traditional risk factors, Black race has also been postulated as a contributing factor for the development of CVD. Almost half of all U.S. Blacks at least 20 years of age carry a diagnosis of CVD, whereas only one-third of U.S. Whites in the same age group carry a CVD diagnosis . Similar racial disparities exist in the HIV/AIDS population. Blacks account for almost half of all HIV/AIDS diagnoses, half of all AIDS-related deaths, and the majority of HIV/AIDS-related hospitalizations, despite accounting for only 13% of the total U.S. population [10-12]. Disparities for HIV/AIDS and CVD have been independently documented within the U.S. Black population. However, the development of CVD among HIV/AIDS Blacks has not been well characterized. Therefore, the present study sought to evaluate the literature regarding Black-White disparities for CVD in patients with HIV/AIDS in the United States. A search of the electronic MEDLINE database (January 1, 1950 to May 31, 2010) was conducted to identify relevant articles. The search was limited to articles published in the English language that evaluated CVD among patients with HIV/AIDS. The definition of CVD was adapted from the AHA definition to include heart failure, stroke, coronary heart disease, and hypertension. Congenital cardiovascular defects were not included in the present definition. A description of each condition is outlined in Table 1. * Adapted from the American Heart Association . Acronyms: AIDS=Acquired Immunodeficiency Syndrome; CAD=Coronary artery disease; CHF=Congestive heart failure; CVA=Cerebrovascular accident; CVD=Cardiovascular disease; DVT=Deep vein thrombosis; HCUP=Healthcare Costs and Utilization Project; HERS=HIV Epidemiology Research Study; HIV=Human Immunodeficiency Virus; IHD=Ischemic heart disease; MI=Myocardial infarction; TIA=Transient ischemic attack. Abbreviations: Race: A=Asians; B=Blacks; W=Whites; H=Hispanics; NA=Native Americans; O=Others; PI=Pacific Islanders. A series of initial search strategies using search terms in various combinations were conducted to yield the highest number of articles possible. The final strategy included the following search terms and MeSH headings: for Black race, “Black,” “African-American,” “race,” or “ethnicity”; for CVD, “cardiovascular,” “myocardial ischemia,” “heart failure,” “hypertension,” “cerebrovascular disorders,” or “stroke”; and for HIV/AIDS, “HIV,” or “AIDS.” Additional keywords were then added to limit the number of articles retrieved: “healthcare disparities,” “hospital,” “hospitalization,” “inpatient,” “outpatient,” or “delivery of health care.” Reference lists of retrieved articles were subsequently reviewed to identify additional, relevant articles. Articles were included in the present review if they met the following criteria: 1) involved patients infected with HIV, 2) evaluated CVD, 3) described original research data, 4) included only U.S. populations, 5) compared Black and White patients, and 6) involved non-pediatric populations. Articles that failed to incorporate all six of the above factors were excluded. The combined estimated risk for CVD between Blacks and Whites was not calculated due to the large heterogeneity in study designs, target populations, and endpoint definitions. A total of 43 articles were identified from the literature search; 38 of which were excluded. Fig. (1) depicts the process by which articles were excluded. Of the articles retrieved, 13 were excluded because they did not report original research findings, 11 did not assess CVD, and nine did not evaluate HIV-infected patients. In addition, two articles were not U.S.-based, two articles did not evaluate Black-White disparities, and one article involved pediatric patients. Process of article selection for the literature review. Only five articles met study criteria, the results of which are described herein. Two of the studies detected a race-based disparity, in that HIV/AIDS Blacks were more likely than HIV/AIDS Whites to be diagnosed with CVD. Three studies did not detect such a disparity. The studies are summarized in Table 2 and are presented chronologically based on the year the study commenced. Studies that detected race-based disparities are discussed first. Gebo et al., used a series of retrospective, cross-sectional analyses to document the changing patterns for inpatient diagnoses and causes of mortality among hospitalized HIV patients . Hospital data from 1996, 1998, and 2000 were extracted from the Healthcare Costs and Utilization Project (HCUP) State Inpatient Database. The study included data from 12 of the 27 states that have participated in HCUP (California, Colorado, Florida, Iowa, Illinois, Kansas, Maryland, New Jersey, New York, Pennsylvania, South Carolina, and Washington). International Classification of Diseases, Ninth Revision, Clinical Modification (ICD-9-CM) codes were used to identify CVD-related hospitalizations. Codes 434.0–436.0 were used to denote cerebrovascular disease and codes 410.0–411.9 were used to denote ischemic heart disease. In the combined three years, 316,963 HIV-related hospitalizations occurred. Although there was a progressive decrease in the number of hospitalizations from 1996 to 2000, Blacks accounted for the greatest proportion of hospitalizations for all years: 1996 (41%), 1998 (46%), and 2000 (47%). Whites accounted for a decreasing proportion of hospitalizations: 1996 (28%), 1998 (24%), and 2000 (23%). The authors conducted several multivariable regression analyses in order to identify risk factors for the varying types of hospitalizations, including one model for ischemic heart disease-related hospitalizations and a separate model for cerebrovascular disease-related hospitalizations. All analyses incorporated the following covariates: race, gender, age, and year of hospitalization. Blacks, compared to Whites, were at increased risk for cerebrovascular-related hospitalizations (adjusted rate ratio, 1.24; 95% CI, 1.09-1.41). However, Blacks were found to be at decreased risk for ischemic heart disease-related hospitalization (adjusted rate ratio, 0.62; 95% CI, 0.53-0.72). These different findings suggest that there may be racial disparities for particular types of CVD. Triant et al., conducted a study from 1996 to 2004 to determine the rate of acute myocardial infarction (AMI) and the risk factors for developing CVD in the context of HIV infection . The authors studied both HIV and non-HIV patients that received care on more than one occasion at one of two hospitals, Brigham and Women’s Hospital or Massachusetts General Hospital, both located in Boston, MA. Patients were identified within the Research Patient Data Registry, a repository of clinical and demographic data for both hospitals. Diagnoses of AMI were identified by ICD-9-CM code 410. Only 7% of the 1,044,589 patients in the non-HIV infected cohort were Black, whereas, 23% of the 3,851 patients in the HIV-positive cohort were Black. In contrast, 66% of the non-HIV infected cohort was White and 54% of the HIV-positive cohort was White. There were 189 HIV-positive patients diagnosed with an AMI; however, a racial distribution was not provided. The investigators performed a multivariable regression analysis to identify risk factors for diagnosis of an AMI. Their model controlled for race, HIV status, gender, age, and the presence of cardiac risk factors (diabetes, hypertension, and dyslipidemia). Black race was a significant predictor for AMI in the HIV group (adjusted rate ratio, 1.43; 95% CI, 1.01-2.00; p=0.04). This significant finding implies that among individuals infected with HIV, Blacks had a higher rate of AMI as compared to Whites. The Gardner et al., study was the only prospective study identified in this review . The investigators sought to determine the changing reasons for hospitalization for HIV patients from 1993-2000. The data were from the HIV Epidemiology Research Study (HERS), a prospective, multicenter, cohort study of socioeconomically disadvantaged women with HIV; women with a clinical diagnosis of AIDS at baseline were excluded. The women were recruited from the four study sites participating in HERS: Bronx, NY; Detroit, MI; Baltimore, MD; and Providence, RI. The investigators utilized a composite definition of CVD to include: “cardiomyopathy, ischemic heart disease, coronary artery disease, myocardial infarction, valvular defects, ventricular tachycardia, fibrillation, transient ischemic attacks, angina, congestive heart failure, deep vein thrombosis, and stroke or cerebrovascular accident” . There were 885 HIV-positive women included in the study, of which 61% were Black and 21% were White. A total of 2,088 hospitalizations occurred among all study subjects, of these, 159 were primarily related to CVD. The authors conducted an extensive multivariable regression analysis to identify independent predictors associated with the risk of CVD hospitalization. The model incorporated the following variables: age, race, alcohol use, site, development of clinical AIDS diagnosis, CD4+, HIV-1 RNA, HAART use, renal laboratory abnormalities, hypertension, hepatitis C virus, and injection drug use. The authors did not present the rate ratios for race, as the variable was not a significant predictor for CVD-related hospitalization per their analysis. Rather, progressive disease, including the development of AIDS and lower CD4+, were significant predictors of these events. Richter et al., conducted a retrospective analysis of HIV patients receiving outpatient care between 1996 and 2002 at a large health system in Southeastern Michigan . The primary objective was to evaluate cases of dyslipidemia and metabolic abnormalities among patients with HIV/AIDS. Patient information was retrieved from an existing database and from patient medical records. CVD-related events were identified using ICD-9-CM codes; however, the exact codes were not listed in the study methodology. The authors described a validation process whereby a study investigator confirmed that all CVD-related events were documented in the patients’ medical records. Patients who lacked the supporting data were subsequently excluded from the CVD case definition. Blacks comprised a little over half (56%) of the 900 HIV-positive patients in this study and Whites accounted for 40%. Most (61%) of the 31 CVD events occurred among Blacks. The absolute prevalence of CVD was similar between Blacks and Whites (4% vs 3%; not statistically significant). The investigators did not perform a multivariable regression analysis to investigate predictors of CVD-related events, nor did they comment on the CVD findings between Blacks and Whites, as this was not their primary outcome. Silverberg et al., sought to evaluate racial differences in antiretroviral therapy adherence rates and all-cause mortality in a retrospective, observational cohort study of HIV-infected adults . This was the longest study of all five, lasting from 1996-2005; however, this study was restricted to patients initiating antiretroviral therapy. The data were retrieved from the Kaiser Permanente Northern California HIV registry, an integrated managed care organization that maintains clinical data for over 17,000 HIV patients. While antiretroviral adherence was the primary study outcome, all-cause mortality, including CVD-related mortality, was among the clinical endpoints that were evaluated in this cohort. Of the 4,686 patients included in the study, 20% were Black and 66% were White. There were 521 deaths from any cause. Of the 37 CVD-related deaths, the percentage was numerically greater in Blacks (9%) than in Whites (7%) or in Hispanics (4%). However, no bivariable or multivariable analyses were conducted to investigate possible predictors of CVD-related mortality. This is one of the first literature reviews to investigate racial disparities for CVD in HIV/AIDS patients. As CVD is a rising concern in this patient population, past studies have attempted to identify reasons for this epidemiologic shift. Possible explanations include the toxicities that are associated with long-term HAART exposure, the inflammatory effects of the virus itself, or merely the result of increased life expectancy [2, 18-21]. 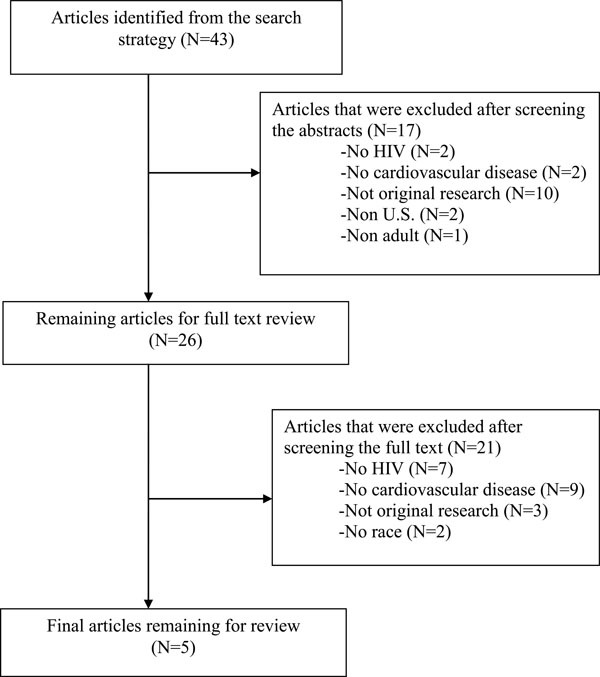 As revealed in this review, few studies have sought to focus on race as a contributing factor for CVD in HIV/AIDS patients. Although five articles met inclusion criteria, the diagnosis of CVD was only the primary outcome for three of the studies. It is, therefore, difficult to ascertain whether or not Blacks with HIV/AIDS have a higher risk for a CVD diagnosis than Whites with HIV/AIDS. The five studies included in this review share few similarities. All five collected data relatively close to the time HAART became available in 1996; however, only the studies by Triant et al., study and Silverberg et al., followed patients for at least nine years [14, 17]. The definition of CVD was inconsistent ranging from unspecified case definitions to a host of conditions that are not typically classified as CVD. Three studies specified that the CVD diagnosis had to occur at time of hospitalization [13-15]. Only two studies concluded Blacks were at increased risk for CVD and these were quite dissimilar in their designs [13, 14]. While Gebo et al., comprised a fairly diverse study population with patients from 12 states, they had the shortest study duration with only three years of cross-sectional data . The Triant et al., study spanned nine years, but they had data from only one city . Interestingly, both studies were the only ones to provide specific definitions of CVD at the time of hospitalization. Both studies conducted regression analyses, but they only accounted for a few variables in their models. For instance, Gebo et al., only controlled for age, gender, and year and Triant et al., controlled for age, gender, and CVD risk factors [13, 14]. Neither could account for objective markers such as CD4+ or HIV-1 RNA. Moreover, the Gebo et al., study findings were actually mixed; they concluded that Blacks were at increased risk for cerebrovascular disease, but were actually at decreased risk for ischemic heart disease . One interpretation is that Blacks with HIV/AIDS are at increased risk for particular forms of CVD (i.e., AMI) as compared to Whites with HIV/AIDS. Alternatively, these mixed findings may represent racial differences in out-of-hospital cardiac events. One limitation to the inpatient study setting is that analysis of hospitalized patients precludes evaluation of such events. As there are known regional variations in the incidence of out-of-hospital cardiac events , Gebo et al.’s wide geographic scope increased their likelihood of capturing such variations in these events, if they occurred. Thus, their conclusion that Blacks were at lower risk of ischemic heart disease-related hospitalization compared to Whites, could be indicative of an underlying problem: Blacks with HIV/AIDS with certain forms of CVD may be underrepresented in the inpatient setting if they experience these events prior to hospitalization. Such disparities have been noted between Blacks and Whites in the general U.S. population and should also be explored in the HIV/AIDS population [23-25]. Of the studies that did not detect a disparity, Gardner et al., were the only investigators to prospectively address the issue . They conducted one of the earliest studies as data collection ended in 2000; their results may not reflect the impact of newer antiretroviral therapies on the development of CVD. This study consisted of an all-female population and excluded patients with a baseline AIDS diagnosis, factors that may limit the generalizability of their findings. Due to the nature of the prospective study design, the investigators were able to account for several variables in their regression analysis, including HIV-specific data such as CD4+, HIV-1 RNA, and antiretroviral therapy use. Despite the rigorous analysis, one key limitation to this study was the composite definition of CVD, which included some conditions that are not included in the generally accepted definitions [7, 8]. Neither of the remaining two studies performed regression analyses, which prevented them from identifying factors that may have been associated with CVD events, nor did they specify what conditions were classified as CVD [16, 17]. Richter et al., only compared the prevalence of CVD events across the races in bivariable analyses and these findings were not statistically significant . Blacks appeared underrepresented in their study, comprising only 20% of their study population, the smallest proportion relative to the other studies . It is important to note that Silverberg et al., primarily assessed medication adherence; their population was restricted to patients initiating antiretroviral therapy . In addition, Silverberg et al., evaluated patients with equal access to care, which may have reduced their likelihood of detecting any disparities . The findings of this review are subject to some methodological limitations. Every attempt was made to include studies that were deemed relevant, but it is likely that some studies were inadvertently omitted or excluded. The definition of CVD was defined according to the widely accepted definition held by the AHA. Alternative definitions might have changed the type of studies selected. Additionally, articles that assessed for surrogate markers of CVD were also excluded, as the intent of this review was to compare and contrast diagnoses of CVD in the setting of HIV/AIDS. Details on racial differences in traditional risk factors for CVD (e.g., high blood pressure, tobacco use, chronic kidney disease, dyslipidemia, age) were largely lacking from these studies. Age was not directly compared across the five studies as age was presented in a variety of formats. Future studies should address potential CVD disparities in aging HIV cohorts, where such events may be more common. Such studies should also strive to control for both race and HIV status. Lastly, this review only included full-text articles that were indexed in MEDLINE in the English language that were published when the review was conducted. Relevant studies in abstract-only format or indexed only in other databases would have been systematically excluded. The review is limited to the time periods that these studies were conducted (1993-2005), highlighting the need for up-to-date data. Blacks in the United States are increasingly at risk for acquiring HIV/AIDS as well as developing CVD, yet the evidence regarding the interaction between race, HIV/AIDS, and CVD is limited. Future investigations should evaluate racial differences in HIV/AIDS patients that develop CVD and differentiate between the different forms of CVD. Funding for this project was provided in part by the National Institutes of Health (NIH) Loan Repayment Program and a graduate fellowship from The University of Texas at Austin, both granted to Dr. Oramasionwu. Dr. Frei is supported by the NIH in the form of a NIH/KL2 career development award (3UL1RR025767). In addition, Dr. Frei has received research grants and/or served as a scientific consultant/advisor for AstraZeneca, Forest, Ortho McNeil Janssen Pharmaceuticals, and Pfizer. Porter K, Babiker A, Bhaskaran K, Darbyshire J, Pezzotti P, Walker AS. Determinants of survival following HIV-1 seroconversion after the introduction of HAART Lancet 2003; 362(9392): 1267-74. Palella FJ Jr, Baker RK, Moorman AC, et al. Mortality in the highly active antiretroviral therapy era: changing causes of death and disease in the HIV outpatient study J Acquir Immune Defic Syndr 2006; 43(1 ): 27-34. Walensky RP, Paltiel AD, Losina E, et al. The survival benefits of AIDS treatment in the United States J Infect Dis 2006; 194(1 ): 11-9. Buchacz K, Baker RK, Moorman AC, et al. Rates of hospitalizations and associated diagnoses in a large multisite cohort of HIV patients in the United States 1994-2005 AIDS 2008; 22(11 ): 1345-54. Betz ME, Gebo KA, Barber E, et al. Patterns of diagnoses in hospital admissions in a multistate cohort of HIV-positive adults in 2001 Med Care 2005; 43(9 Suppl): III3-14. Wyatt CM, Arons RR, Klotman PE, Klotman ME. Acute renal failure in hospitalized patients with HIV: risk factors and impact on in-hospital mortality AIDS 2006; 20(4 ): 561-. Lloyd-Jones D, Adams RJ, Brown TM, et al. Heart disease and stroke statistics--2010 update a report from the American Heart Association Circulation 2010; 121(7 ): e46-e215. Oramasionwu CU, Hunter JM, Skinner J, et al. Black race as a predictor of poor health outcomes among a national cohort of HIV/AIDS patients admitted to US hospitals a cohort study BMC Infect Dis 2009; 9(1 ): 127. Gebo KA, Fleishman JA, Moore RD. Hospitalizations for metabolic conditions, opportunistic infections, and injection drug use among HIV patients: trends between 1996 and 2000 in 12 states J Acquir Immune Defic Syndr 2005; 40(5 ): 609-16. Triant VA, Lee H, Hadigan C, Grinspoon SK. Increased acute myocardial infarction rates and cardiovascular risk factors among patients with human immunodeficiency virus disease J Clin Endocrinol Metab 2007; 92(7 ): 2506-12. Gardner LI, Klein RS, Szczech LA, et al. Rates and risk factors for condition-specific hospitalizations in HIV-infected and uninfected women J Acquir Immune Defic Syndr 2003; 34(3 ): 320-0. Richter A, Pladevall M, Manjunath R, et al. Patient characteristics and costs associated with dyslipidaemia and related conditions in HIV-infected patients a retrospective cohort study HIV Med 2005; 6(2 ): 79-90. Silverberg MJ, Leyden W, Quesenberry CP Jr, Horberg MA. Race/ethnicity and risk of AIDS and death among HIV-infected patients with access to care J Gen Intern Med 2009; 24(9 ): 1065-72. Friis-Moller N, Sabin CA, Weber R, et al. Combination antiretroviral therapy and the risk of myocardial infarction N Engl J Med 2003; 349(21 ): 1993-2003. Friis-Moller N, Weber R, Reiss P, et al. Cardiovascular disease risk factors in HIV patients--association with antiretroviral therapy Results from the DAD study AIDS 2003; 17(8 ): 1179-93. Ford ES, Greenwald JH, Richterman AG, et al. Traditional risk factors and D-dimer predict incident cardiovascular disease events in chronic HIV infection AIDS 0000; 24(10 ): 1509-7. Smith C, Sabin CA, Lundgren JD, et al. Factors associated with specific causes of death amongst HIV-positive individuals in the D:A:D Study AIDS 2010; 24(10 ): 1537-48. Nichol G, Thomas E, Callaway CW, et al. Regional variation in out-of-hospital cardiac arrest incidence and outcome JAMA 2008; 300(12 ): 1423-31. Nallamothu BK, Lu X, Vaughan-Sarrazin MS, Cram P. Coronary revascularization at specialty cardiac hospitals and peer general hospitals in black Medicare beneficiaries Circ Cardiovasc Qual Outcomes 2008; 1(2 ): 116-22. McNally B, Robb R, Mehta M, et al. Out-of-hospital cardiac arrest surveillance --- Cardiac Arrest Registry to Enhance Survival (CARES) United States October 1, 2005--December 31 2010 MMWR Surveill Summ 2011; 60(8 ): 1-19.